This ship was the first Royal Navy aircraft carrier to be purpose built for use as a Repair and Maintenance vessel for aircraft. However she was fitted with a full length flight deck to enable landings or launch of existing types of carrier borne aircraft and so could also be deployed for operational use as a Fleet carrier. Her hangars were intended to house any type of aircraft used by the RN including amphibians which could be embarked by crane and launched from a catapult. The lifts were large enough to accommodate the larger amphibians. This ship saw operational service as a Fleet Carrier during WW2 and could act as a landing platform if any accompanying Fleet Carrier was unable to land aircraft after action damage. Maintenance workshops with ample capacity for carrying stores required for aircraft maintenance and repair as well as for ship equipment were provided. Her designed displacement was 16,510 tons at full load with an overall length of 640 feet, a Beam of 90 feet and draught of 19 feet at full load. Turbine machinery of 40,000 SHP drove two shafts to provide a speed of 22 knots. Her main armament was four twin 4” AA mountings with 2pdr Pom Pom mountings all of which were radar controlled. These were supplemented by 20mm Close Range Oerlikon mountings during service. An aircraft warning radar Type 281B was fitted to provide aircraft control and give warning of air attack. Hangar space enabled about 35 aircraft to be fitted for operational use and housed aircraft embarked for repair or when ship was deployed as a Ferry Carrier. The number carried depended on the type of aircraft and was fewer after WW2 when these were larger. Her complement including aircrew if used operationally was over 1,000. The value of this type of aircraft carrier was fully justified both during WW2 in the Mediterranean and later during UN service in Korea when she was used as a Ferry Carrier as well as in the maintenance role. A proposal made after she had been placed in Reserve for the second time was that she be converted for use as a troop carrier but this was not accepted and she was then sold for scrap. 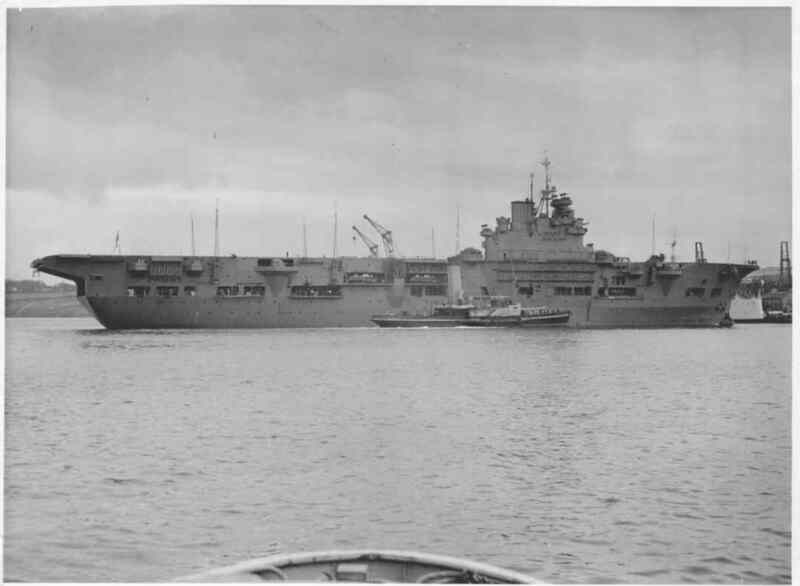 UNICORN Class Aircraft Maintenance and Repair aircraft carrier ordered from Harland and Wolff at Belfast on 14th April 1939 and laid down on 29th June that year. Launch on 20th November 1941 was delayed by suspension of work on several occasions because of higher priority being given to completion of work on smaller warships required for convoy defence. She was the 14th RN ship to bear this name, introduced in 1544 for a 36 gun ship taken from the Scots at Leith. It had last been used for 1 5th Rate built at Chatham in 1824 and still afloat Dundee after WW2 renamed CRESSY. This latter ship was then eldest serving RN warship still in the water and remained in use as the headquarters of the Tay Division RNR until 14th July1959 when sold for demolition. Build of this maintenance carrier was completed on 12th March 1943. Badge: On a Field Blue, a unicorn rampant White, armed and winged Gold. Commissioned for service with Home Fleet. 12th Build completion and commenced Acceptance Trials in Clyde area. to May at Scapa Flow. ships of Home Fleet based at Scapa Flow. June Home Fleet work-up in continuation. in Mediterranean in Force V.
January Passage in Mediterranean to Alexandria. 12th Frigates detached on arrival at Alexandria. 30th Arrived at Trincomalee via Red Sea to join Eastern Fleet. to against Japanese installations in Sumatra. January Nominated for special duty. his appointment as Governor General. operations by Fleet Aircraft Carriers of British Pacific Fleet. British warships for service in 5th US Fleet in SW Pacific. 15th British Pacific Fleet transferred and became Task Force 57. Deployed at Manus for repair duties. British Pacific Fleet, now designated Task Force 37 and attached to US 3rd Fleet. 24th Took passage to Manus to provide aircraft repair during planned operations off Japan. July Aircraft repair and transport duties based at Manus in continuation. August Manus duties in continuation. HMS UNICORN remained in the Far East after VJ Day and was deployed with the British Pacific Fleet, which had returned to RN control. Task Force 112 was disbanded after the termination of operations off the mainland of Japan. The ship carried out aircraft repair and support of Fleet Air Arm aircraft carriers and took part in the extensive activities to return military and civil. personnel held in captivity by Japan in the Far East. In December 1945 she was nominated for return to UK and arrived at Devonport on 16th January 1946. She was Paid-off and de-stored prior to reduction to Reserve status. Brought forward for service in 1948 she was refitted for use as a Maintenance and Replenishment aircraft carrier. In 1949 after recommissioning she was deployed to support HM Light Fleet Aircraft Carrier TRIUMPH which had been transferred to the Far East to reinforce the RN presence after deterioration of relations with communist China. Retained in the Far East after the outbreak of the Korean War she was used to ferry aircraft between the aircraft carried deployed off Korea as part of the UN naval operations off Korea and Singapore for repair. 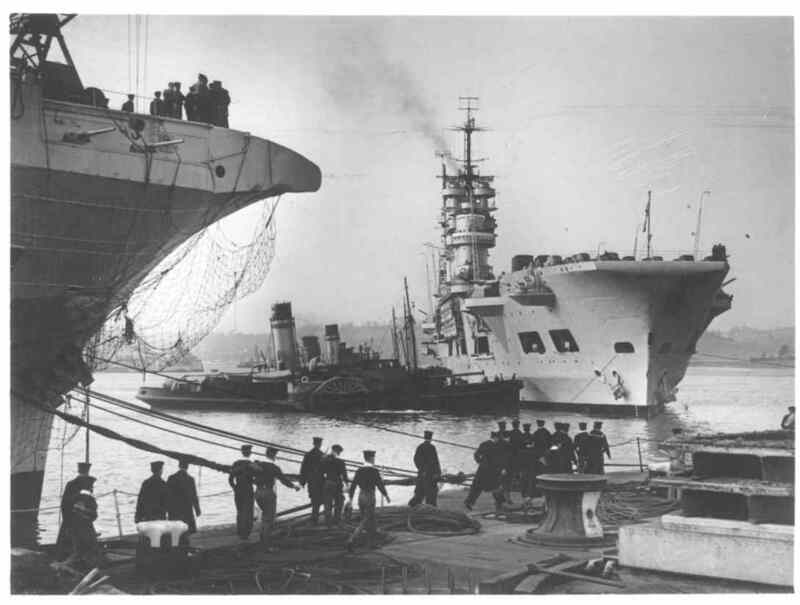 On release from Far East service in 1954 she returned to UK and was again Paid-off into Reserve. She refitted in 1955 to up-date her repair facilities but remained in Reserve on completion. Placed on the Disposal List in 1958 as part of the reduction of the number of ships in Reserve, she was placed on the Disposal List and sold to BISCO the next year. The ship arrived in tow at Dalmuir on the Clyde for demolition by Arnott Young on 15th June 1960 and was later towed to Troon to complete the work.